Here’s your chance to hear great bluegrass music – Menlo-Atherton High School style! 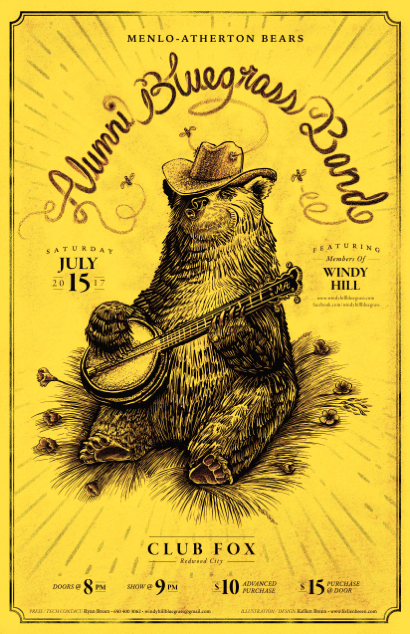 The finest bluegrass pickers to emerge from the halls of Menlo-Atherton High School are getting together this Saturday, July 15, for a special show at Club Fox in Redwood City (2209 Broadway). Since graduating in 2004 and 2005, Ryan Breen (banjo), Henry Warde (guitar), Kyle McCabe (bass), and Andy O’Brien (mandolin) have developed into some of California’s most respected bluegrass musicians. While each member of the group has forged their own unique musical career, this tight group of friends has over 30 years of combined experience playing together and is responsible for forming some of the Bay Area’s most respected bluegrass groups over the last decade, including Windy Hill and Steep Ravine. To incentivize other M-A alums’ attendance, the band is offering $5 off at the door to those who announce their M-A affiliation. The group will also feature special guests, who are also M-A alums. Doors open at 8:00 pm; show starts at 9:00 pm. Tickets are $10 in advance; $15 at the door ($10 with M-A affiliation).